I've been honored to perform for thousands of special occasions throughout my 20 years of piping, and over the years I have carefully selected what I believe to be the very best of Scottish and Irish music. I think you'll agree. Weddings: Performing for Guest Arrivals, Ceremony Prelude, Processionals, Ceremony, Recessionals, Postlude, and Reception, as you would like. Feel free to call me or email me and I will send you a helpful packet of information, which includes my free CD. Corporate Events: Golf Tournaments, Work Parties, Birthday Parties, Awards Ceremonies, St. Patrick's Day Celebrations, Ski and Mountain Resort Entertainment and all other events. Private Parties: Clan Gatherings, St. Patrick's Day Celebrations, Burns Suppers, Birthday Parties, Graduation Day Celebrations, and all other events. 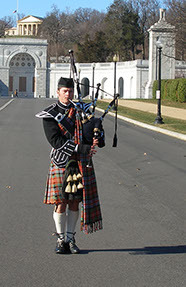 Funeral Services and Memorial Services: Scott performs in either Scottish or Irish kilt tartans and is impecably dressed to memorialize your loved one for his or her memorial service. Offering Amazing Grace, Danny Boy and or Irish Eyes are Smiling for Irish heritage families and Amazing Grace, The Dark Isle, My Home, Flowers of the Forest or Over the Sea to Sky for Scottish heritage families as well as America the Beautiful and any service songs for American services at Fort Logan and elsewhere. 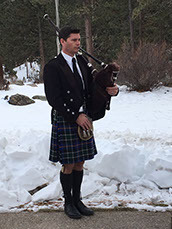 Call Scott, he would love to discuss the details of your loved one's service (Scott performs for a large number of services each year and is the choice bagpiper for many of the most respected funeral homes in Colorado). All Occasions: Performing all occasions, as you would like. Feel free to call me and we can discuss your event, or special occasion. Adding a Celtic touch to your special occasion or event will make it unique and memorable. 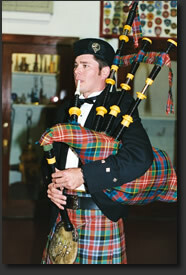 Trust your piping to the authentic and experienced bagpipe performances of Scott Beach.